As you may have noticed, a link to the list of properties condemned in Cleveland (since April 1) has been added to the sidebar titled "Information You Need". It has been updated through October 3. Future updates will be posted as they become available. It can now be sorted by street. As I noted before, being condemned does not mean that a structure will be demolished - rather, it is the first step in the process that leads to the demolition of a structure - and the best time for us to act. I've now gone through the list, some 1500 entries, using Google Street View and Bing maps aerial photographs and tried to identify the most significant properties. For a full detailing of what my notes mean, see this post. Your help is still needed to determine which, if any, of these structures were the homes of famous Clevelanders. 6611 Euclid Avenue, the structure in the lead photo behind the Dunham Tavern, is on the list. As I mentioned before, it lost its façade to the RTA's Health Line. While it doesn't have the historic importance of some structures that I've advocated for, and it doesn't have much in the way of architectural detail, I believe that it is really important. It's the last major industrial structure remaining in this vicinity. Its massive, looming hulk provides significant historical context for the Dunham Tavern. 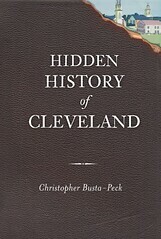 It illustrates the direction that Cleveland took, and how what was once a rural road became the major artery for an industrial city. 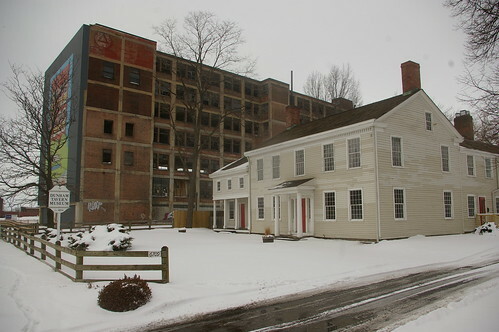 The survival of the Dunham Tavern among blocks of empty lots and two or three story structures is unimpressive. When one can see what it stood up against, it is much more significant. 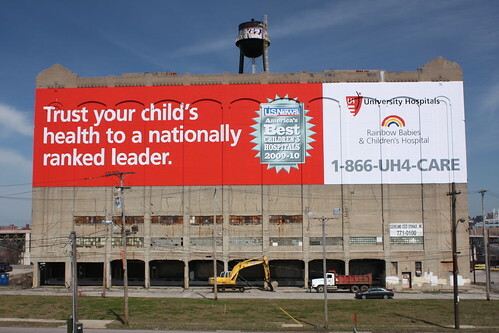 The building is owned by the RTA - in other words, us - we'll have no one to blame but ourselves when it is demolished. There's one more item - another condemned structure - to add to my post, Euclid Avenue: What We've Lost and What We Will Probably Lose. The former grocery store at 8400 Euclid Avenue is the only other building on the block that the Cleveland Play House stands on. It will likely be purchased by the Cleveland Clinic. The structure does not appear architecturally significant to my eyes. Rather, I mention it as a further indicator of the transition of this street. The historic Cold Storage Building was added to the list on September 24. This will likely make it easier for ODOT to demolish the structure. In future posts, I will address more of the structures on this list. Again, I appreciate any assistance you can provide in identifying those that are most historically significant.